ST bei Borderline und Narzissmus - schematherapie-wiens Webseite! the goal is for the therapists to have mastery of the basic adaptations of Schema Therapy interventions for use in groups. 2. Understand and be able to implement limited reparenting in a group. 4. Be able to establish safety and connection in the group setting. the goal of the advanced workshop is for therapists to have mastery of the core interventions of GST at the advanced level i.e. ability to meet the requirements of the Group ST Rating Scale. This will allow them to conduct GST with a less intense level of supervision. 1. Be skilled at managing the necessary safe and reliable frame of GST. 2. Be able to do imagery rescripting in the group. 4. Understand and be able to employ symbols and transitional objects that match the developmental levels of the group when in child modes and for reparenting. 5. Be able to employ limit setting and empathic confrontation in groups. 6. Be able to create opportunities in sessions for Happy child mode play. 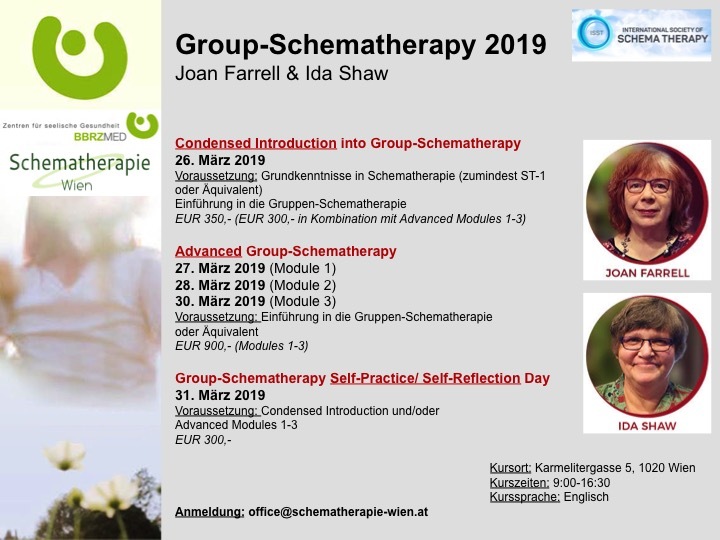 the goal of the self-practice day is to give therapists the experience of Group Schema Therapy interventions as a member of the group. This experience of ST from the inside out provides both personal benefit and a deeper understanding of patient's experience leading to improved empathy and attunement.